One of the most striking highlight of Essene Gospel of Peace is Jesus Christ's teaching of Earthly Mother. Its not only startling for traditional Christians who inherited present day Christian doctrines that came through filtering out of almost all gnostic teachings, thus stripped off most of the mystical, esoteric teachings of Christ; but as its clear, even the people of his time was also puzzled when Christ was teaching using the term, "Earthly Mother" to the audience (i wonder what was the original aramaic / hebrew term for Earthly Mother). In the beginning of the Essene Gospel of Peace, book one, as Christ was among many sick and maimed, the opening passage records what proceeded from his blessed lips: "Happy are you that you hunger for the truth, for I will satisfy you with the bread of wisdom. Happy are you, that you knock, for I will open to you the door of life. Happy are you, that you would cast off the power of Satan, for I will lead you into the Kingdom of our Mother's angels, where the power of Satan cannot enter." Jesus replies: "Your Mother is in you, and you in Her." Now in strong Patriarchal Jewish tradition, Divine was not addressed in Feminine term. Its in the East such as ancient Indian tradition Divine Manifestation is naturally addressed as Divine Mother or simply Mother with capital M. From the response of the audience its clear that they were not familiar with the usage of the enigmatic term, Earthly Mother. Its remarkable that as Christ goes on with the conversation he distinctly mention about Heavenly Father along side with Earthly Mother. That makes the whole point very interesting. 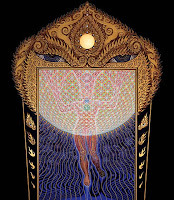 In tantric wisdom, the human body with its biological and psychological processes is an instrument through which the cosmic power reveals itself. A Tantra text says: 'He who realizes the truth of the body can then come to know the truth of the universe'. 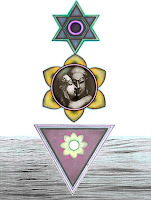 In tantra the physical body is the vehicle to enlightenment and its amazing how Christ bring a lot of attention to the physical body and its laws to keep it pure for the sake of spiritual evolution. And afterwards Jesus spoke thus to them: "Even as your bodies have been reborn through the Earthly Mother's angels, may your spirit, likewise, be reborn though the angels of the Heavenly Father. Become, therefore, true sons of Your Father and of your Mother, and true Brothers of the Sons of Men ..."
Though he purposefully used two different mental image, he never moved away from the Oneness of God. When it comes to indicating Supreme Oneness, he used the term 'God' purposefully; for example "... for your God is the God of Peace, and does never help division .."
Its clear that Christ was conveying the Archetype of Feminine Face of God in the accessible concept, in the symbol of Earthly Mother, which the people of that time was prepared to understood. Earthly Mother was as if the Manifest Face of God and Heavenly Father was reserved for the Hidden Face, the Transcendental aspect of the Divine. Jesus was using the term Earthly Mother to prepare the mind for the even more Grander, Majestic reality of the Divine. Its clear from this passage, "I have still many things to say to you, but you cannot bear them yet. For your eyes are used to the darkness and the full light of the Heavenly Father would make you blind. Therefore you cannot understand that which I speak to you concerning the Heavenly Father who sent me to you. Follow, therefore, first, only the laws of your Earthly Mother, of which I have told you. And when her angels shall have cleansed and renewed you bodies and strengthened your eyes, you will be able to bear the light of our Heavenly Father. ..."
"For the Son of Men live in the Heavenly Father and Earthly Mother, and The Heavenly Father and Earthly Mother live in them." "And pray every day to your Heavenly Father and Earthly Mother, that your soul become as perfect as your Father's Holy Spirit is Perfect, and that your body become as perfect as the body of your Earthly Mother is perfect ..."
Everything in the creation, from matter - antimatter to male - female, all are created in opposites. Human beings are comprised of two distinct elements, immaterial soul and physical body. In the journey of our being, one can not neglect the spirit in order to only take care of the material side; but one must not neglect the body either, and take interest only in the spirit. Enlightenment is a results from an union of the two poles of the one-energy. In far eastern tradition this is the union of Yin and Yang, Shiva and Shakti. Jesus teaches in the Essene Gospel saying that when we unite the two, a beautiful magic happens, wholeness emerges. This union is the secret key to reveal the Kingdom of God within. "... then shall disappear from the earth all evil and all sorrow. And then shall be love and joy upon earth. And then shall the earth be like the heavens, and the Kingdom of God shall come." And the secret door to that union is love. Again to quote Christ, "It is by love that the Heavenly Father and the Earthly Mother and the Son of Man become one." Paramahansa Yoganananda in his book The Yoga of Jesus rightly says, "Jesus went very deep in teachings that appear on the surface to be simple - much deeper than most people understand ... In (his teachings) is the whole science of Yoga, the transcendental way of divine union .."
In Greek: Gaia ("land" or "earth", from the Ancient Greek Γαîα; also Gaea or Ge is the primal Greek goddess personifying the Earth. Gaia is a primordial and chthonic deity in the Ancient Greek pantheon and considered a Mother Goddess or Great Goddess. 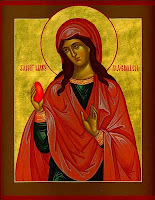 Also in this ancient Byzantine Greek icon, in Sophian Gnosticism Sophia is the feminine aspect of God. In Hinduism / Sanatana Dharma : Shakti (Devi Prakriti) the feminine energy of the Divine. it is the personification of the divine feminine aspect, often referred to as 'The Divine Mother'. In Buddhism / Far East: White Tara (Sanskrit: Sitatara; Tibetan: Sgrol-dkar) is sometimes called the Mother of all Buddhas and she represents the motherly aspect of compassion. Her white color signifies purity, wisdom and truth. Tara is a female Buddha, a manifestation of the ultimate wisdom of all the Buddhas. Tara is also know as the 'Mother of the Conquerors'. Tara is depicted as common mother or Holy Mother. In Judaism: In Jewish wisdom tradition Shekhinah represent the feminine attributes of the presence of God, based especially on readings of the Talmud. In Islam: The very words Rahman and Rahim, two widely cited attribute of Allah manifested through the teachings of Quran are derived from the root R-H-M which means Womb of Mother (also symbolize the Cosmic Protection of Mercy). Both Rahman and Rahim represent essentially the Feminine qualities of universal compassion and mercifulness of the Divine. According to the well-known prophetic tradition, on the Throne of God it is written, "Verily My Mercy and Compassion precede my Majesty and Wrath." Thus the inner dimension of reality is inseparable from the Feminine quality of Mercy and Compassion, the Divine Feminine aspect of GodHead. The Prophet Muhammad is reported to have said: "Al-Rahman is the beneficent One whose love and mercy are manifested in the creation of the world ...". The term Earthly Mother which carries the meaning with the created world, earth - is a different way of describing the same concept of the unspeakable Reality of the Divine in an accessible term.